It’s booked! You’re going clubbing in Ibiza this summer! You can’t wait, 2 weeks of sun, sea and partying! You turn up in the early hours after a tiring midnight flight, “they were the cheapest” you tell your mates!!. As you enter the badly lit apartment, a musty damp smell greets you. As you put your suitcase on the stained sheet of the uncomfortable looking bed, it hits you!! Why did I not read the hotel reviews before booking? Don’t make the same mistake I did and make sure you look at holiday reviews before choosing your next holiday to Ibiza. Did you know 47% of travellers to Ibiza DON’T research their hotel? Having spent time in Ibiza, I can tell you the best places to stay. For the Ibiza nightlife and wonderful sandy beaches, choose Playa d’en Bossa or San Antonio. Everyone asks; Where is the best place to stay in ibiza for clubbing? I’ve looked at budget apartments to top of the range luxury hotels. The following accommodation will be suitable for your cheap holidays to Ibiza. The Mare Nostrum is a fantastic and popular hotel, centrally located and within easy walking distance from the beach and nightlife. 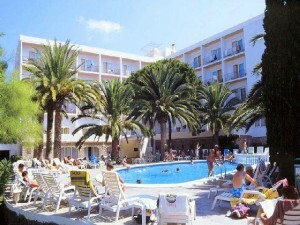 The hotel has over 500 rooms, all with en-suite, balcony or terrace, TV with music channels, a safe and air conditioning. There is a sun terrace around the swimming pool, snack bar and restaurant, sports court and a full entertainment program in the day and evening in the summer months. This affordable hotel is right on the door step of all the nightlife. A large terrace surrounds the swimming pool complete with sunbeds and shades. The hotel has a restaurant and snack bar, table tennis and pool table. The bedrooms sleep up to 3 people and have a bathroom, air conditioning, TV, mini fridge and safe. 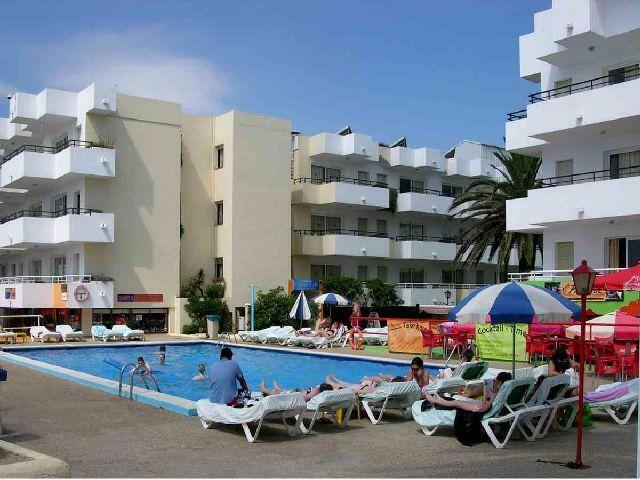 This complex is in the heart of the nightlife and provides a lively base for those wanting to be close to the nightlife and the beach. The Jet Apartments have 3 swimming pools (1 at it’s sister hotel), gym, internet cafe, massage room and pool tables. You’ll also find a restaurant, bars and a supermarket. The apartments are either 1 bedroom (sleeping4) or 2 bedroom (sleeping upto 6 adults). All have bathrooms, air conditioning, TV, kitchenette and terrace or balcony. Superior apartments have full sea views and a large screen TV whilst VIP apartments come with 2 bathrooms. 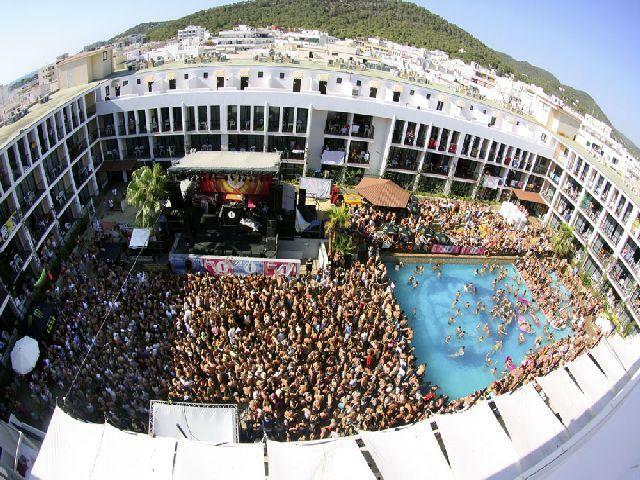 Set in the heard of San Antonio, Ibiza Rocks is where it all happens. 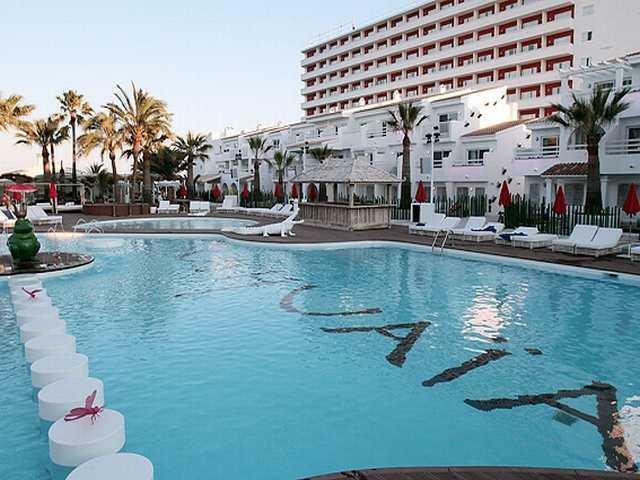 Live gigs, pool parties, DJ’s and much more make this hotel perfect for your stay in Ibiza. The hotel has 2 swimming pools, (1 with everyday pool parties), 2 restaurants, 4 bars with a chill-out lounge and a live stage. All the bedrooms are nicely decorated and all have bathrooms, kitchenette, micro-wave and air-conditioning with balcony. Superior rooms are available and have plasma TV’s and an XBOX. If you want to stay in a luxury hotel in Ibiza, there is no other place to stay than the fantastic Ushuaia Beach. Weekly live entertainment, top DJ’s and fashion shows are just a few things that make the Ushuaia one of the best hotels in Ibiza. The VIP Concierge will help you out with in-room parties and booking tickets for concerts and clubs. The guest rooms are elegantly furnished with en-suite bathrooms, black out windows, air-conditioning, wifi, satellite TV and either terrace or balcony. Have you stayed in one of these hotels or apartments? Let us know and we’ll add your comments so others can find the best clubbing holidays Ibiza.